James Joyce’s “The Dead” is widely considered to be his best short story, called by the New York Times “just about the finest short story in the English language” and by T.S. Eliot as one of the greatest short stories ever written. The storyline is simple enough: a long-married Irish couple – Gretta and Gabriel Conroy – attend a lavish dinner party thrown by his aunts in celebration of the Feast of the Epiphany (January 6). At the party, they each have a variety of conversations with assorted party guests, and Gabriel gives the evening’s post-dinner speech and leads the toast. As Gabriel and Gretta leave the party, the snow which had been lightly falling when they arrived at the beginning of the evening has become quite heavy. The closing scene finds Gretta asleep at their hotel while Gabriel stands at the window looking at the snow blanketing the city. Gabriel feels, in fact, that the snow is falling over the entirety of Ireland. Before falling asleep, Gretta had shared a memory about Michael Furey, the Irish activist lover of her youth. The reader is left to wonder whether Gabriel feels sorrow or acceptance over his wife’s confession that she still harbors feelings for her former lover. While “The Dead” is quite a famous story, less well known to the general public is its place as the culminating story in Joyce’s first book, a collection of short stories titled Dubliners. The collection was rejected 17 times over a 10-year period, with some of those rejections being based on what publishers and printers considered to be objectionable material. Finally published in 1914, this collection of 15 stories was Joyce’s first attempt to bring his native city to life. Of course, he would go on to write again and again about the Irish capital, most famously in his 1922 novel, Ulysses, which recounts one day in the life of Leopold Bloom as he makes his way through the streets of Dublin. But Dubliners was Joyce’s initial portrait of a city he both loved and hated. Each story in the collection features a different resident of Dublin, and each tells a different tale of the suffocating, dreary lives lived in this city. The characters presented here suffer from spiritual paralysis and squelched freedom. Joyce himself admitted that the stories capture some of the unhappiest moments of life. If you’re looking for uplifting literature, Dubliners is not the book for you. To consider the ending yourself, you’ll want to read this powerful story, which you can do for free at Project Gutenberg (and in fact, you can read the entire Dubliners collection there as well). If you prefer a hard copy, there’s an inexpensive Dover Thrift Edition . You might also want to watch John Huston’s 1987 film adaptation of “The Dead.” It starred his daughter Angelica Huston as Gretta Conroy and Donal McCann as her husband, Gabriel. Want to dig deeper? A helpful glossary of terms is available, and a digitized copy of the first edition of Dubliners can be found at Internet Archive. Richard Ellman’s biography of James Joyce remains the standard, though its revised edition was published more than 30 years ago. Cornell’s James Joyce Collection is outstanding. You might also want to visit The James Joyce Centre – either online or in person in Dublin! Listen and Watch:Listen as I read the opening pages of “The Dead,” and to close things out, watch the film’s ending. 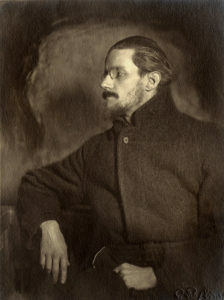 Image Credit: James Joyce in 1918, just four years after the publication of Dubliners. Public domain. https://commons.wikimedia.org/wiki/File:Revolutionary_Joyce_Better_Contrast.jpg.